A spice that is made from seeds of the black cumin plant. A member of the parsley family of plants, black cumin is native to parts of Asia, India and Pakistan where the seeds are harvested. Narrow, tiny and curved in shape, Kala Jeera has a strong earthy aroma that becomes nutty flavored when cooked. 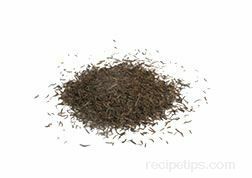 Although it is not the same as cumin, it can be similarly used in small amounts to enhance the flavor of meats, soups, stews, rice, and sauces.